160 presets, 80 major presets plus 80 shadow presets, 8 (+8) presets per bank, 10 banks. 8 loops, 5 as series loops and 3 as separate loop, loop5 is stereo loop. Programmable A / B / Y (stereo) outputs. Each preset sends editable midi program change numbers (0 ~ 127, off) to 2 midi channels (1, 2). Moen just keeps getting more and more innovative and this one is their flagship Looper designed for the serious musician. Get your effects "under control" Brand new from Moen! Seems we all have a wide array of effects that we have assembled in the past. Now it's time to get all the Tone Monsters out and let them loose. 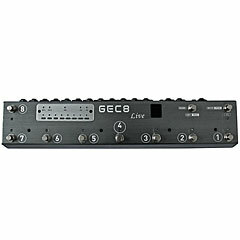 The new Moen GEC8 Live offers superfast switching, initial set-up and switching presets on the fly is very easy as well. True Bypass, zero "POP" sound when engaged. The GEC8 Live is a work of art and loaded with options. 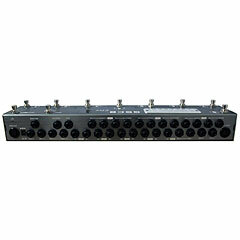 Brand new midi capability is featured along with a shadow footswitch option, or even a tap tempo switcher for units such as Strymon and Eventide. Very nice!